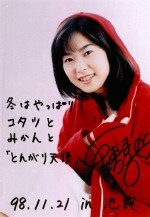 There was an event on November 21, 1998 to commemorate Toyoshima Machiko's first mini-album, Tongari Tenshi. The event was called X'Machirin (pronounced ku-ri-su-ma-chi-ri-n), and it took place in Sunshine City, at the fountain area. The event was open for anyone to watch, but those who bought the CD were able to get a photo of Machiko, given to everyone by Machiko herself. Machiko has done three other events at Sunshine, but this was the least crowded. There were only about 1000 people watching. I went 4 hours before the event, and got ticket number 236. They let the first 250 people go into the roped area in front of the stage, but I chose to watch from the second floor, as I was able to secure a spot near the center. Unfortunately, pictures were not allowed. There was a short rehearsal from around 13:30. Machiko wore street clothes and a hat during the rehearsal. The hat covered her face, so it was impossible to see her face from the second floor. During the event, Machiko wore a long white dress, and a red jacket. This is the same outfit that she wore for the pictures in the CD. Machiko sang Tongari Tenshi, Rock'n Princess, Nami Oto, and Watashi ha Machiko. Tongari Tenshi and Nami Oto were slow songs, and Rock'n Princess and Watashi ha Machiko were fast songs. Machiko did move around the stage more than she did in the past. There were also some presents given away. The numbers were 224, 225, 228, and a couple others that I don't remeber..
After the event, Machiko passed out a photo (with a printed message and signature on it) to everyone who bought the CD. She didn't do a handshake session because those have been taking too much time (the previous two times).